Edgar Martinez, born in Toluca, Mexico, came to Vallarta at the age of 6. Although Edgar feels deeply inspired and influenced by the great masters, he has worked diligently to create his own style. He considers himself a surrealist with a basis in the classics. While there is a richness to his paintings that makes one ask if he was trained in Europe, Edgar draws from his Mexican culture to create the subjects in his paintings, often depicting bulls, bull fighters or village scenes. He works in a medium of marble powder mixed with oil, painstakingly layered to create textures, allowing him to express himself more as an expressionist rather than a realist. These textured layers give his paintings life by allowing light, a crucial element in his work, to dance across the canvas. Edgar’s discipline and confidence in his own works never fails to surprise us and leave us wanting to see more. Seashells – the primary element of this show – functions as an exclamation of surprise, used to express an emotion that traps the senses. The human mind is unique, and process of creating and materializing an idea is an extraordinary event that, in essence, makes Edgar’s work have a cultural, esthetic and historic value. He has created a firm step to conscience in the elaboration of the work, and it is important that the work speaks for itself. There is success when the senses of an individual are moved, and Edgar works to move these senses by taking the spectator with him on an imaginary trip. “I have been working for several years in oil, using a technique like no other. Even though I may appreciate others, oil is the only medium that truly fascinates me. In relation to the art: creating, imagining, sharing one’s own vision, is without a doubt a great satisfaction.” The gestures and attire of Edgar’s characters tend toward classic renaissance, and the chiaroscuro is elemental and defines his style creating an expression that is both creative and magical achieving a difference between that ordinary and the unimaginable. Cherie´s focus over the last few years has turned to Water Birds in their natural environment. Her sensitivity to their habits and relationship with the water that supports them is captured profoundly in her paintings. Her mastery of both birds and their watery environment are second to none. Water Birds, as with all things in nature, bring one a sense of calm and peace. Cherie´s artistic mission is to provide the viewer with a tranquil moment amid a world filled with chaos. The stillness of her work counteracts the rapid pace of everyday life, reminding us all that there is so much beauty and peace to be found in nature, just by being quiet and observing it. 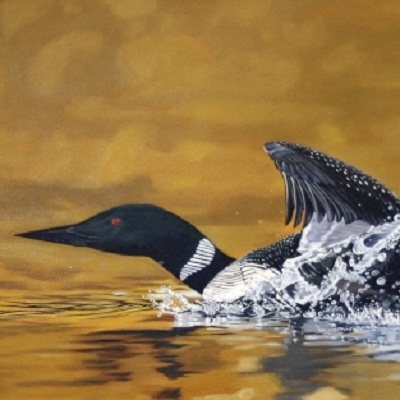 The focus of her work this year has been The Great Northern Loon (Gavia immer). These birds are found in the northern parts of North American, Greenland, Iceland and Great Britain. They spend the summers in lakes where fish are abundant and there are suitable nesting grounds. They fly to the coasts and winter in the oceans. They sport distinctive, black and white plumage (when breeding), have a wingspan of 5 feet and weight about 9 lbs. They are ungainly on land due to their legs being positioned at the back of their bodies, which contributes to their name “loon”, but the joke stops there. They are efficient predators of both fresh and saltwater fish, powerful swimmers and adroit divers. Perhaps the most striking thing about these birds is their call. It has been called “haunting”, “mystical”, “thrilling”, “and enchanting”. Cherie will also be presenting a video of her work and the loons, bringing the viewer full circle in experiencing these most wondrous of birds. 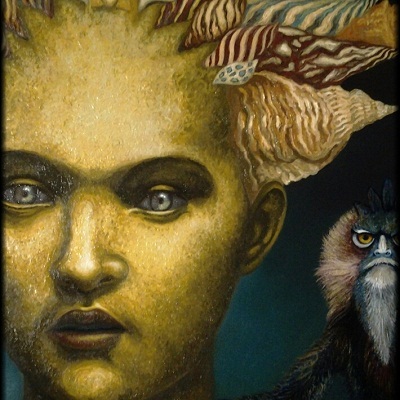 Cherie is a native of Southern Louisiana, with a BFA and has been teaching adult art classes for the last 13 years. Her work is collected internationally, and her reputation has steadily grown over the years. She now divides her time between Mexico and Canada when not traveling elsewhere.